POCC stands for Power Over Cervical Cancer. 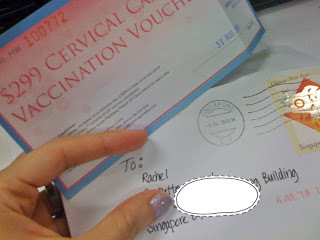 It is a campaign to help women in Singapore to protect themselves against cervical cancer. What and where is the cervix? The cervix is part of a woman's reproductive system. It's in the pelvis. The cervix is the lower, narrow part of the uterus (womb). Cervical cancer is a disease that affects the cervix in the female reproductive system. It is one of the most common cancers affecting Singapore women. The symptoms may be absent until the cancer is in its advanced stages. Go for a vaccination - This is the ONLY preventable cancer. I have checked with Drs Thompson. I need to take 3 jabs to complete the vaccination and it costs $150 per jab. First jab on the first month, second jab on the second month and third jab on the fourth month. That would be $450 in all. Sounds expensive but it is said to last for 10 years. I think it's worth the investment and I've decided to go for the vaccination next month. Their website is totally cool and tech savy with many multi media functions. It has lots of information on cervical cancer, allows you to do a self-evaluation and shares real stories and experiences of other women. They are on facebook as well. Check it out and be a fan. Power Over Cervical Cancer is a campaign that aims to make Singapore the country with the lowest incidence of Cervical Cancer and they need your help to spread the word. Pledge your support for this cause and protect those you care about by telling them about Cervical Cancer. Together, we have POWER Over Cervical Cancer. Click the button below to begin! A very kind cotter mailed me a voucher from Healthway. It's $299 for 3 jabs. First jab on 11 July 2010, second jab on 11 August and final jab in Jan 2011. Those who are keen, please leave me a comment and I will ask the doctor if I can extend this offer at $299 nett. Hi Sail, I checked with the doctor again. I am allowed to just refer one other person for the offer, which I already did.